When you hear this, I highly recommend you run away — as fast as you can. After doing this for so many years I can tell you that 9 times out of 10, they are going to be some of the worst clients you’ll ever have. They don’t see the value of what you offer, and that’s a bad sign. But there are times when working for free is a good idea. You have to come up with your own rules. For me, I only work for free when it’s for karma, friendship, or a piece of the pie. If you’re really looking to build a portfolio and get testimonials (without being a glorified intern) take a look at non-profit and charitable organizations. 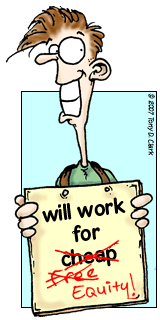 There are many organizations that don’t have the resources to hire quality freelancers. If you’re looking to do some free work just to develop a track record, put your skills to work for someone who needs it, and where you’ll feel good about it. Doing work for friends and family is often a given. I’ll sometimes do work for someone, just because they are a friend. There also may be opportunities to barter with friends and acquaintances — trading design for programming, financial coaching for auto repair, writing for artwork, etc. Usually if I’m working for free, it’s not really for free. It’s for the promise of a payoff later. Joint ventures, and working for a percentage of a project, can be a win-win for both parties. It also makes you really think about a project before taking it on. Keep in mind that old-school traditional companies will look at you like you sprouted a second head if you bring this option up. But start-ups and other entrepreneurs are often looking for partnering opportunities, and your skills may be a good fit. If you’re going to spend all the time working on a project complaining about the jerks that scammed you, and how you can’t believe you’re doing this, then walk away. If you feel like you’re going to get something out of it, either by feeling good about the project, or another payoff, then it might be worth pursuing. Remember it’s up to you to determine your value. How you approach your work is going to set the standard for the work that you do. So, what are your rules for working for free?